Students explore the St. Scholastica campus during the Discover Duluth event. 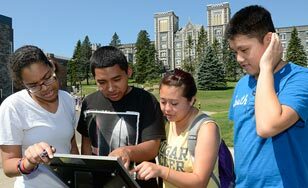 Discover Duluth is one of the College's outreach efforts to students who face barriers to higher education. It's an expenses-paid, three-day college preparedness program aimed at high school students from the Twin Cities who will be the first members of their family to attend college, or who face other hurdles. This year's program, the second annual, was in July. It drew more than 40 participants, compared to 14 the first year. The students were introduced not only to St. Scholastica, but to the sights and cultural opportunities of the broader Duluth area. Current St. Scholastica student mentors helped make the high schoolers feel at home. "This fits closely with St. Scholastica's mission of trying to create an environment for all of our students that's inclusive and diverse," said senior admissions counselor Laurajae Johnson, who coordinated the event. "It's definitely more involved than our typical campus visit, and that's great because we get an opportunity to 'wow' and impress those students." View Duluth's ABC affiliate, WDIO-TV Channel 10's coverage of St. Scholastica Supports First-Gen Students.